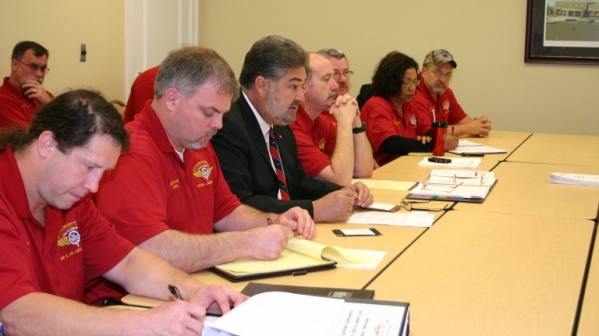 Southern Territory GVP Bob Martinez (center) joined members of the Local 2003 Bargaining Committee for the opening round of negotiations with Army Fleet Services, a government contractor employing more than 3,500 IAM members at Ft. Rucker in southeastern Alabama. Representatives of Local 2003 at Ft. Rucker, AL, opened negotiations this week with Army Fleet Services for a new collective bargaining agreement covering over 3,500 workers at the sprawling army base. The facility, located in southeastern Alabama, provides pilot training and services for the U.S. Army’s helicopter fleet. The current contract between the IAM and Army Fleet Services expires on May 1, 2011.